You are here: Home / General Information / Animals Today July 21, 2018. Illegal trade of smaller wild cats. Do you live in a pet friendly city? What does the law say when a dog bites a trespasser? Coral Reef Awareness Week. 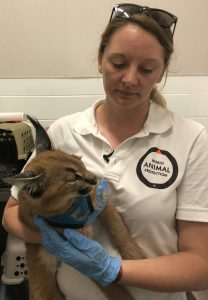 Animals Today July 21, 2018. Illegal trade of smaller wild cats. Do you live in a pet friendly city? What does the law say when a dog bites a trespasser? Coral Reef Awareness Week. This show begins with Kelly Donithan, US Exotic Pets Manager at World Animal Protection. 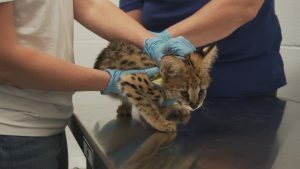 Recently, four servals, two caracals and one savannah cat were confiscated from an alleged dealer in New York. Staff from World Animal Protection triaged the malnourished and diseased juveniles, stabilized them, and transported them to safety. Donithan is seeing more evidence of illegal trade of the smaller wild cat species, which is easier to conceal than the trade in larger cats like tigers. Peter and Lori then review interesting survey results from WalletHub about the most and least pet-friendly cities in the US. Certainly some surprises in this large and detailed study! How does your city rank? Then, Peter welcomes attorney Richard Rosenthal, who represents a family trying to save their dog from being killed by the State of Connecticut. The dog, Simon, while protecting his own yard, bit, but did not seriously harm, a young trespasser, resulting in the seizure of the dog. Listen in and tell us what you think about this case. Contact Mr. Rosenthal here. The show continues with Peter explaining the amazing new technology referred to as “organ on a chip.” We conclude with a challenging little quiz to recognize Coral Reef Awareness Week.